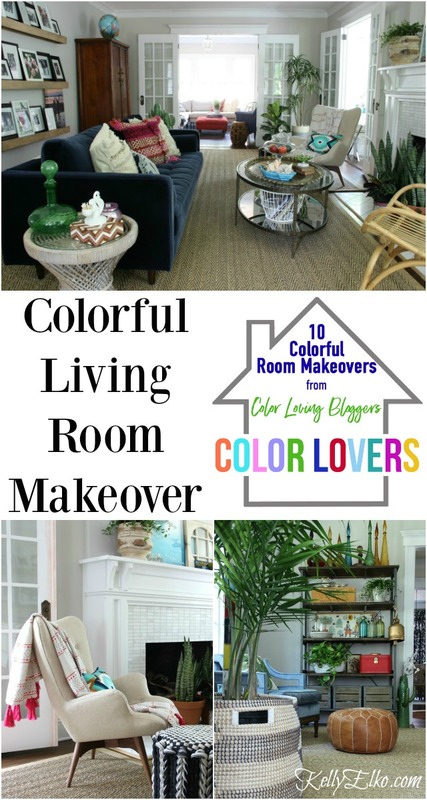 Color Lovers – My Colorful Living Room Makeover! you’ll find my colorful living room makeover! Last month, I showed you my Color Lovers Design Plan for this space and I’ve been working feverishly to turn my dream into reality. Raise your hand if you love color? 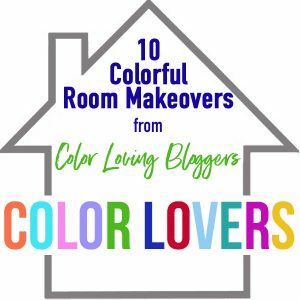 I’ve teamed up with nine other Color Lovers and each of us made over one room in our homes. I link to all of them at the end of this post – I’m also sharing all source info there. Now let’s bring on the color! 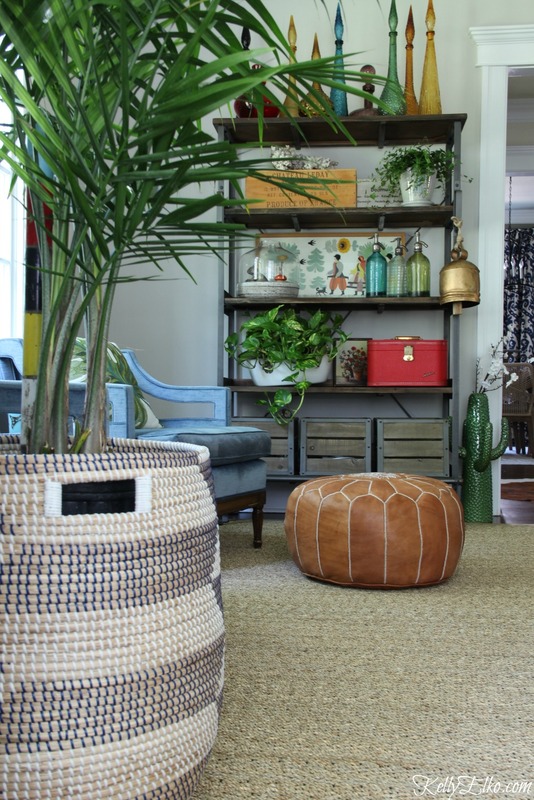 I’ve teamed up with some of my favorite shops including The Mine, Birch Lane, Minted and more as well as shopping my own house and using some of my favorite vintage finds and tons of plants to bring a fresh look to this once tired looking room. I’m sharing the full source list at the end of this post and I’ve included affiliate links so you can shop the look. I could not be happier with the after. It’s a casual, kick up your feet, pour yourself a glass of wine, light a candle and unwind kind of space. First, we gave the room got a fresh coat of paint in Agreeable Gray by Sherwin Williams. It’s the perfect warm gray in my humble opinion. 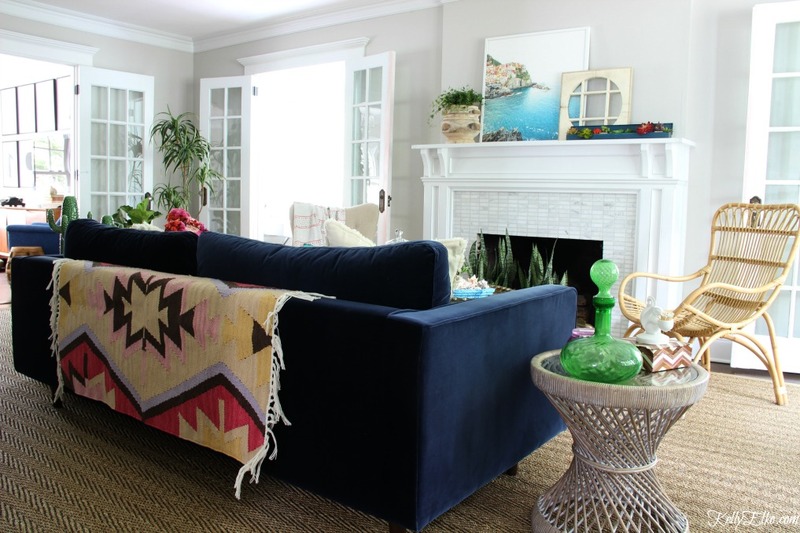 I added a vibrant rug to the back of my blue velvet sofa for a fun jolt of color. 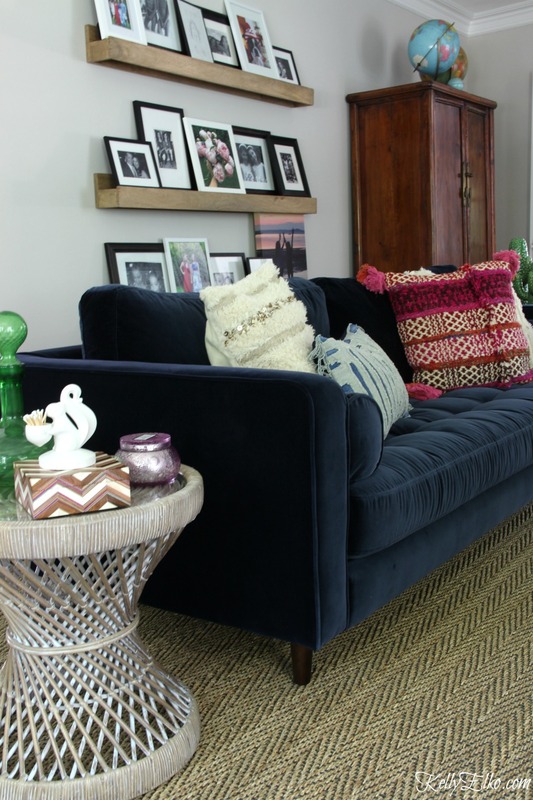 The blue sofa was the catalyst for this room makeover. A collection of textured and colorful pillows make it even more inviting and I love adding different sized pillows like this blue lumbar pillow with fringe for more interest. 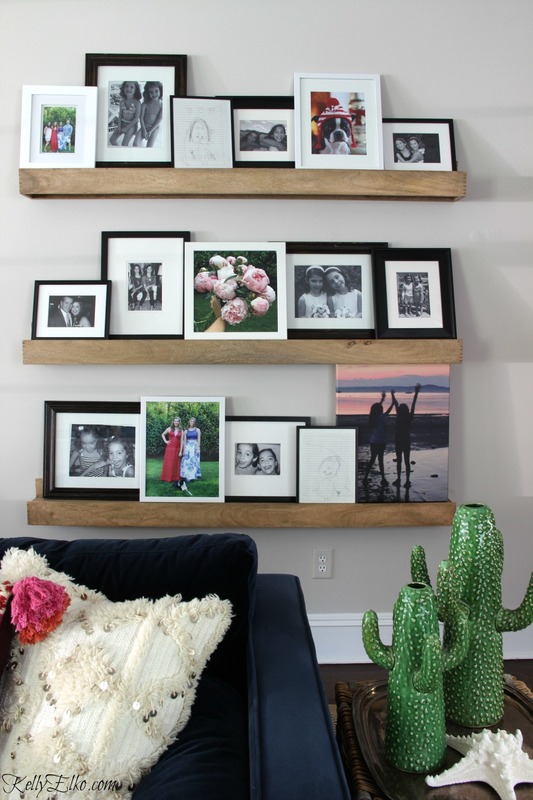 I love these warm Wood Art Shelves with exposed joints to show off family photos. A few colorful ones pop against the mostly black and white pics. That hideous creature with protruding ears holding a glass of wine in one hand and a remote in the other is a portrait of me drawn by one of my girls when they were young! An equally hideous drawing of my hubby sits on the lower shelf! 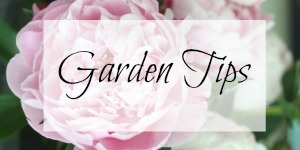 To help get that image out of your head, you can get my Pretty Pink Peony Printable for Free HERE. 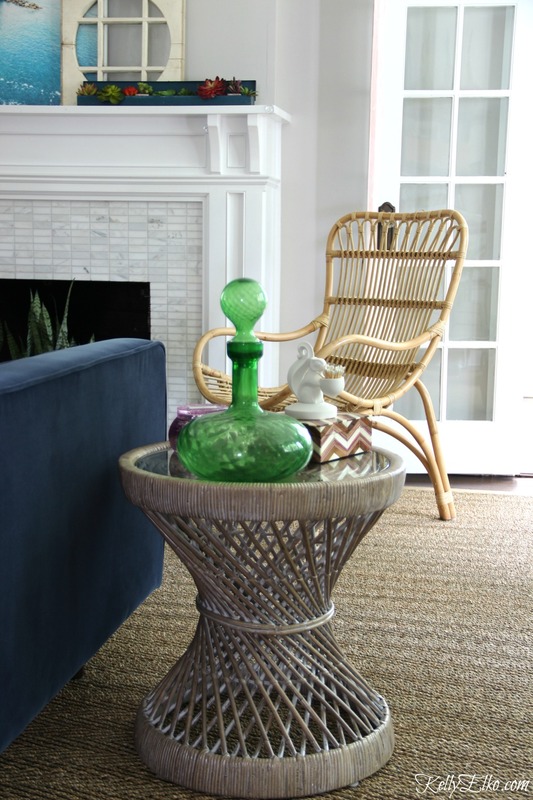 I added a Rattan Chair from HomeGoods (don’t be afraid to bring an outdoor chair inside like I did) and table and love the casual feel they bring to the room. 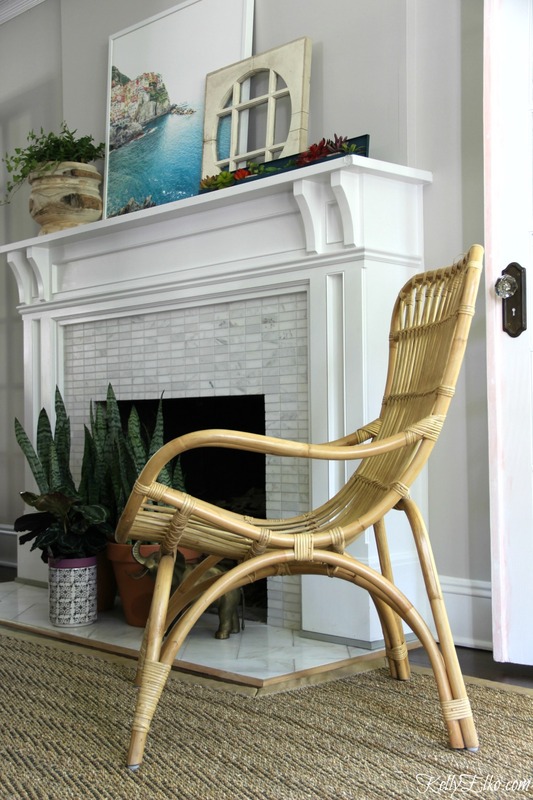 This little Rattan Chair is one of many round pieces I brought into the room to soften the lines of the long rectangular space. 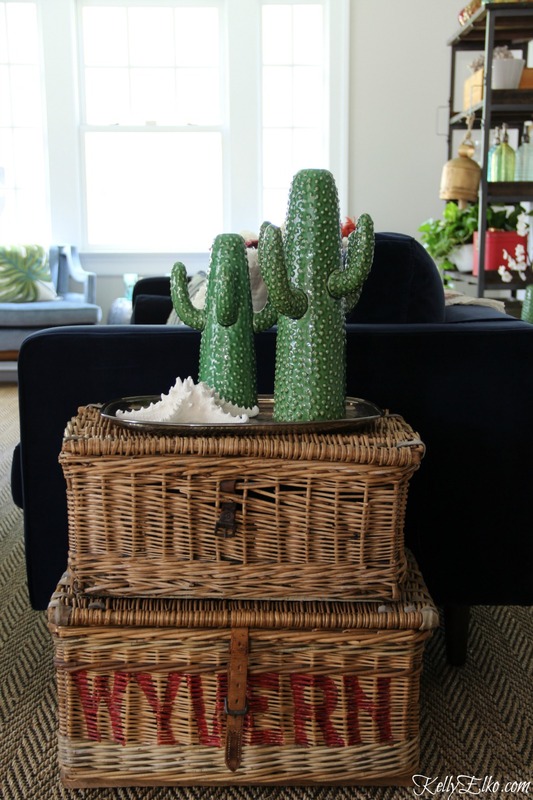 Vintage stacked baskets with an old silver tray adds more texture while quirky cacti vases add personality. 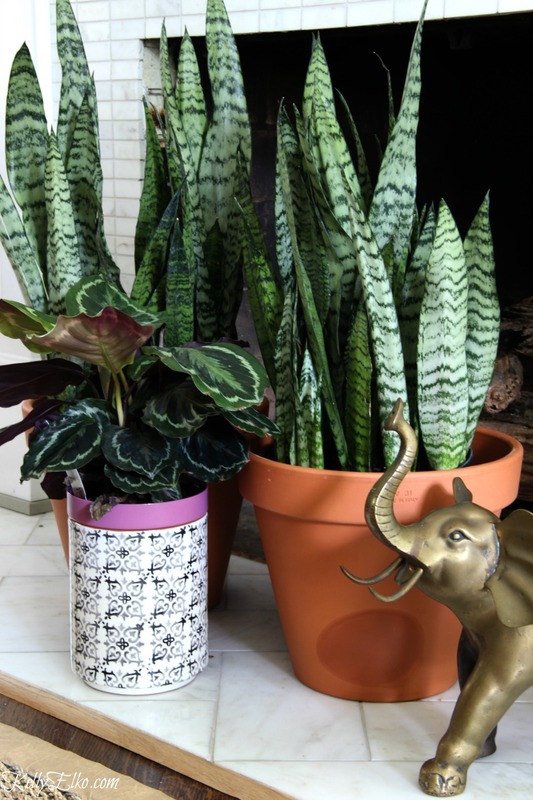 I added tons of plants to this room and love this pair of snake plants (also called mother in laws tongue!) 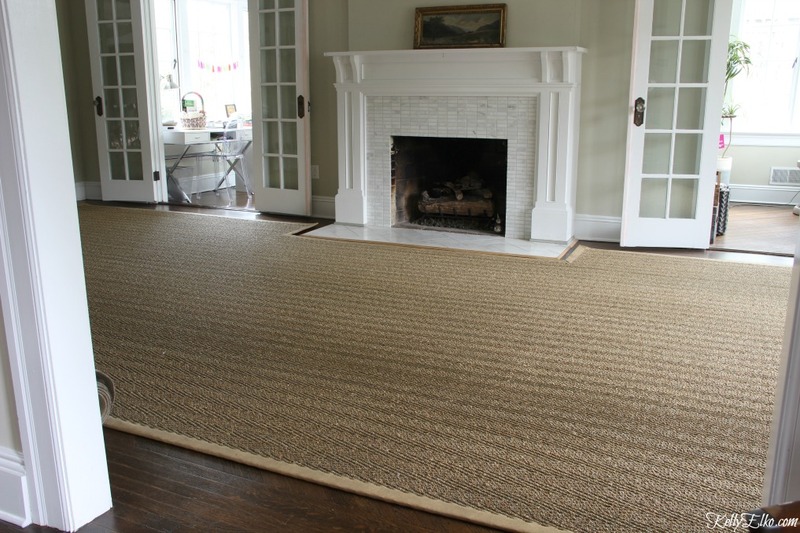 that are super easy to care for plus they fit perfectly on the hearth to hide the black hole of a fireplace in the warm summer months. I wanted the capiz shell chandelier that’s always hung in the center of the room to be the star so I removed two ornate chandeliers that flanked it and replaced them with Simple Schoolhouse Lights. 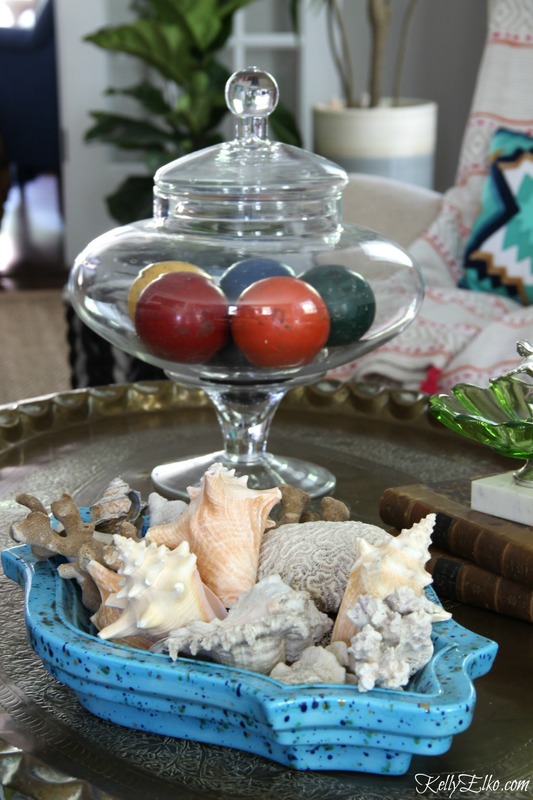 The coffee table gets colorful with a huge vintage ashtray that holds shells and coral and a glass jar filled with croquet balls. I love the fun shape and legs of this Teddy Bear Chair! 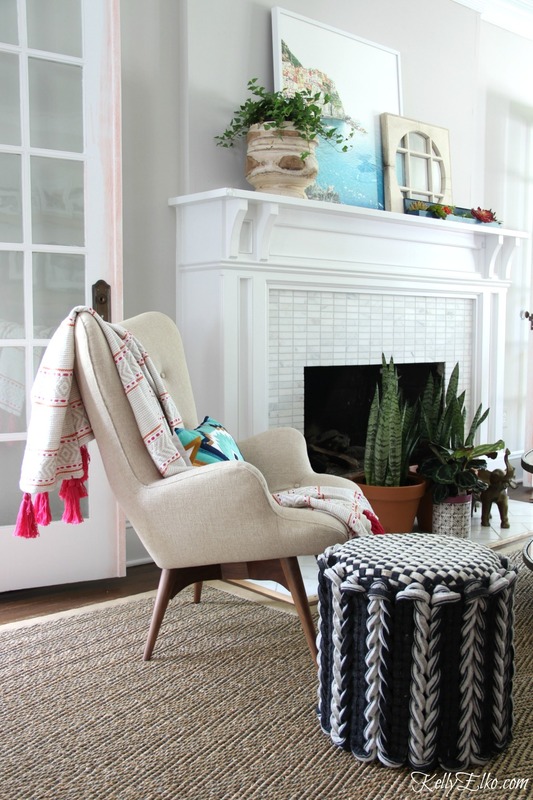 What’s better than pink tassels to add personality to a neutral chair and this Chunky Braided Wool Ottoman is perfect for kicking up your feet or holding a favorite book. 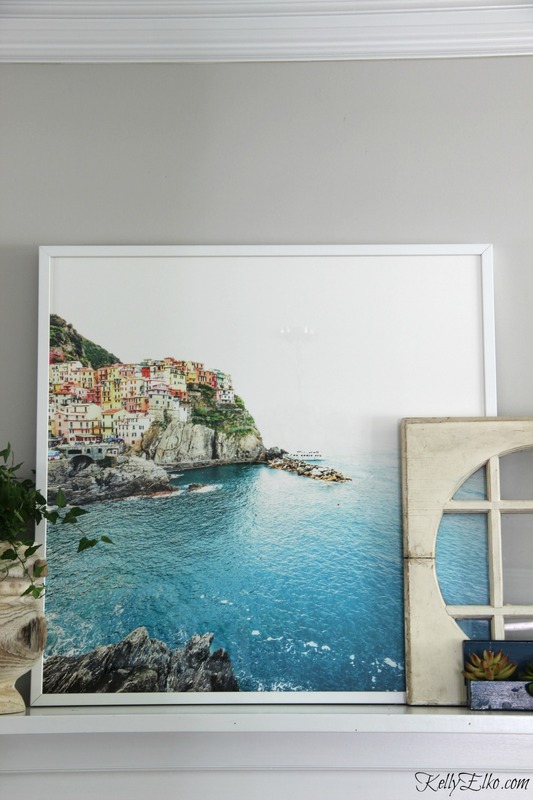 My mantel is simple with an oversized photograph of Cinque Terra from Minted that has me dreaming of an Italian getaway. 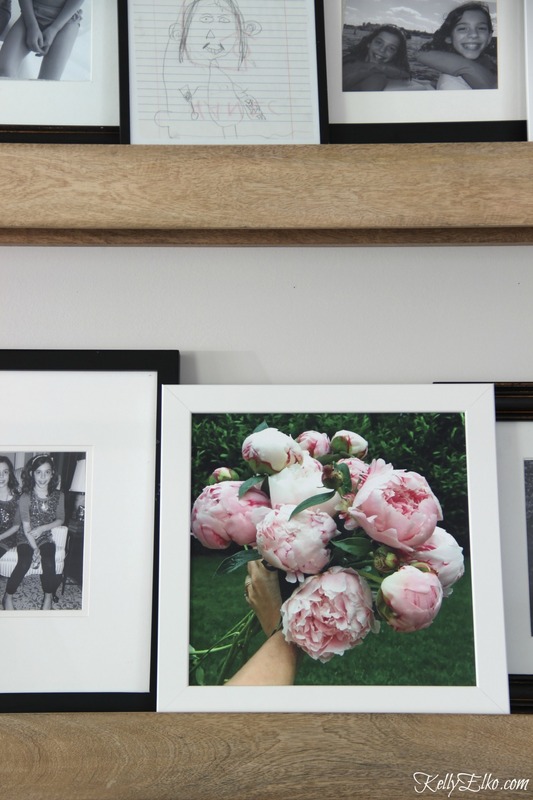 I love the way modern photography instantly updates any space. 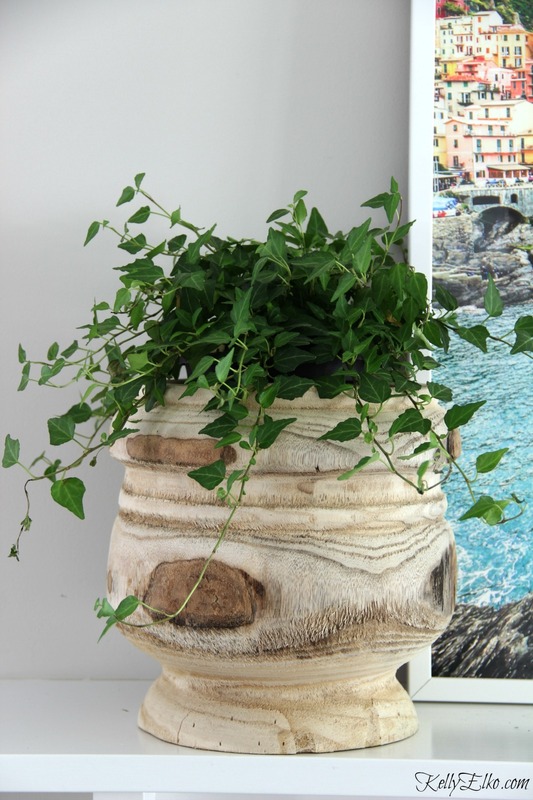 Ivy trails from this incredible Wood Planter. I had the most fun styling my Industrial Book Shelf. My collection of mid century decanters gathered at flea markets over the years sparkle when light from the nearby window hits them. Growing up, we had a leather hassock in my family room. 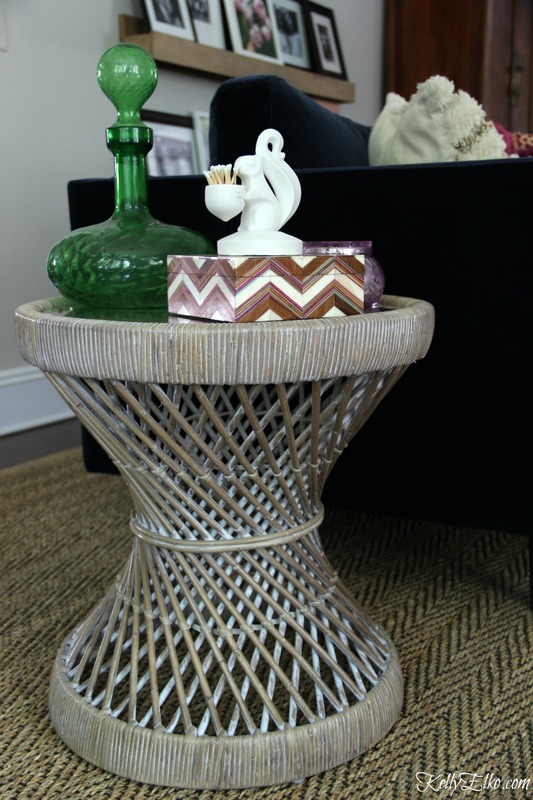 This Moroccan Leather Pouf is a modern take on that 70’s staple. Years ago at a consignment shop, I scooped up this pair of mid century club chairs in their original blue velvet! I added these indoor/outdoor palm leaf pillows. 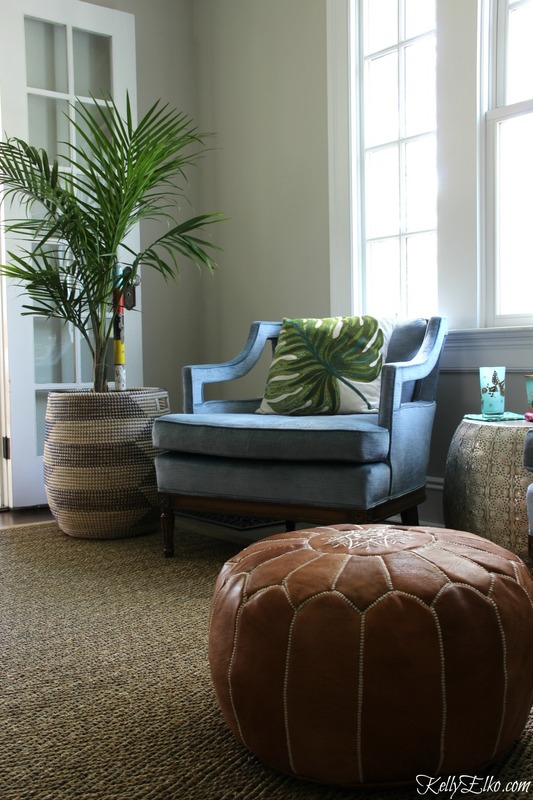 A palm tree adds height opposite the tall bookcase and the Woven Basket adds color and pattern. Can you tell which on is faux? 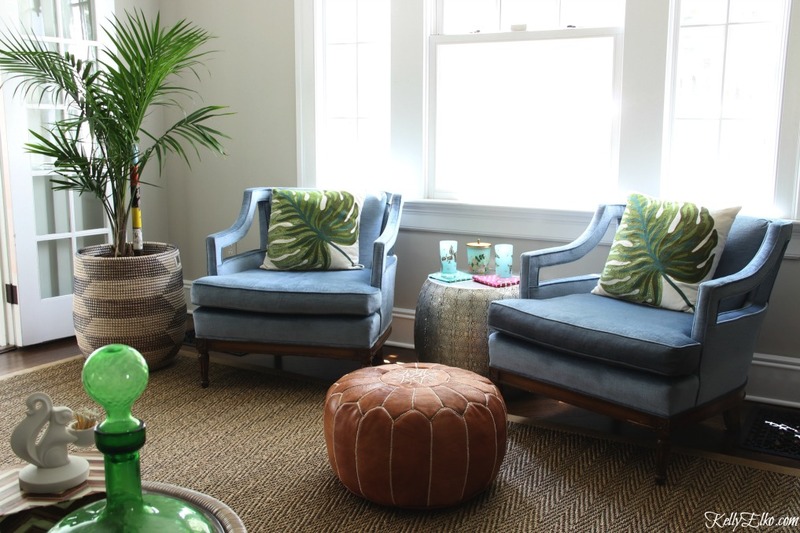 A fiddle leaf fig and tropical palm literally add life to this corner. Visit my colorful friends who have each made over a room in their homes. Kelly, I feel like I took a colorful trip around the globe. The room is positively drenched in texture and pretty muted jewel tones. I especially love the art wall & the picture on the mantel. Beautiful my friend!! ❤️????? Thanks Shannon – what a treat to get to makeover a room in such a short time. I usually add things over time but I loved this challenge and hope you love your cottage and enjoy every minute in it! it looks awesome, kelly! i love the mantle art- it is so vivid and i love the color it brings! and i dig the homegoods chair! 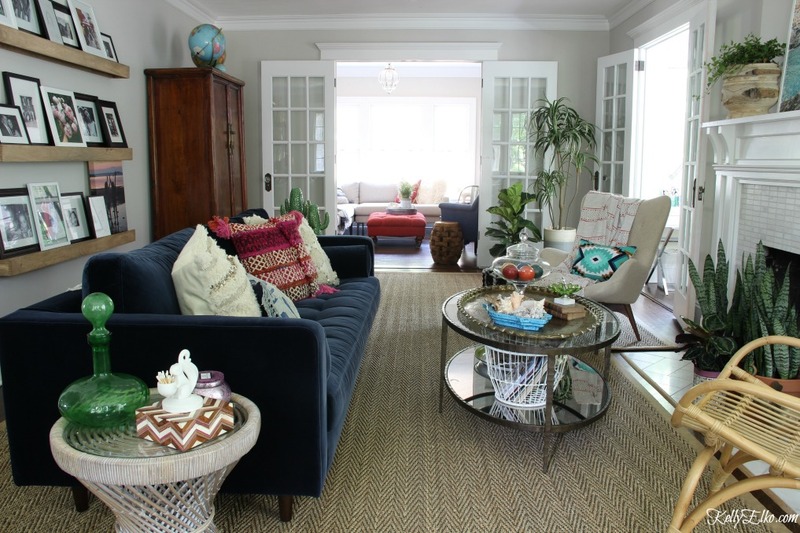 Thanks Cassie – I always love bouncing decorating ideas off of you! Kelly, I am loving this room and all the beautiful colors and textures! Such a pretty sofa and those drawings are adorable! Great space! I think the drawing is a true likeness of me! Kelly, it looks beautiful! 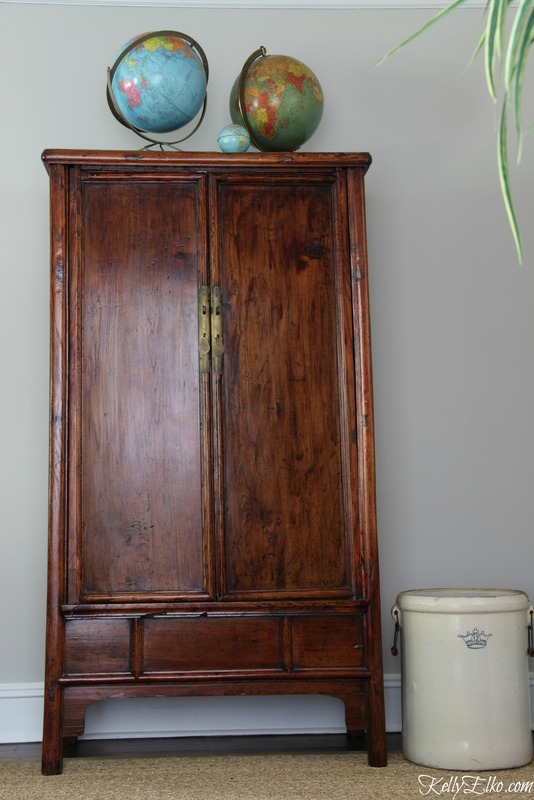 I love how you mix all the vintage and such interesting things in your spaces. 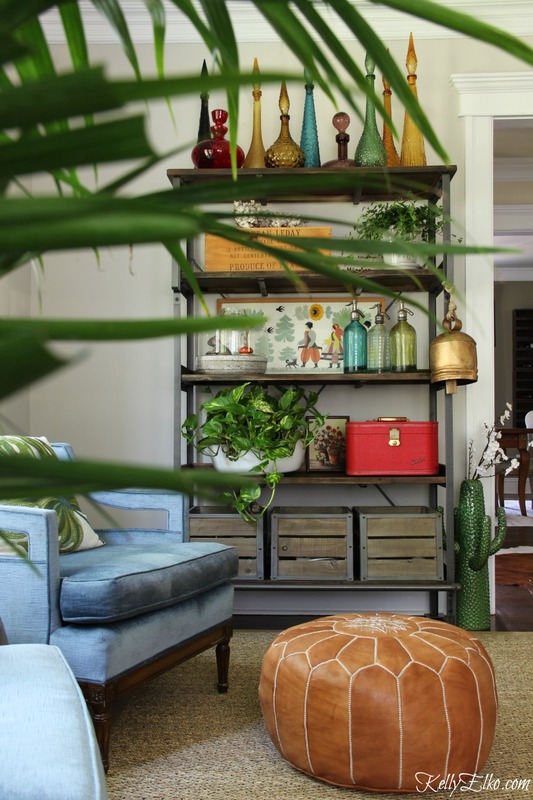 That sofa is gorgeous and all your collectibles bring together such an eclectic look. Thanks again for putting this all together and letting me be a part of it! It was such a fun collaboration! Thanks Rhoda – I’m glad you got to makeover your porch. It’s stunning – enjoy it! The party starts when you arrive! Oh my goodness. Your room is so beautiful Kelly! I love all of the color you have incorporated. The details are amazing. And those gallery wall shelves are spectacular! 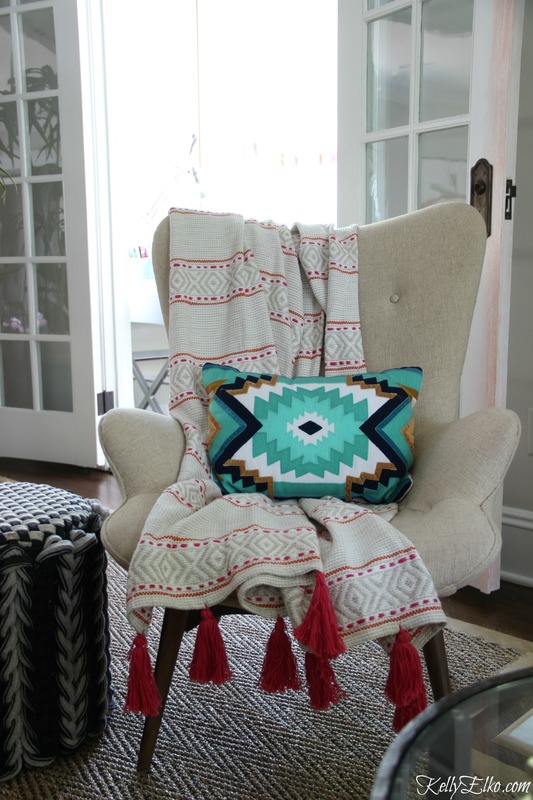 Dibs on the comfy corner and cozy tasseled throw. I’ll bring the wine! Love your design and color choices, Kelly! Beautiful living room! 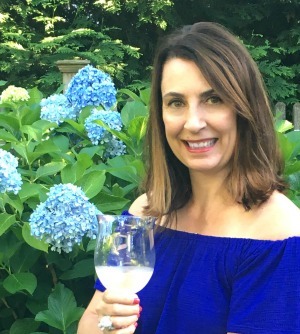 You’re always welcome … with wine! Thanks my friend – I had so much fun making over this room and hope you love your new space as much as I do! Great. Now I want a blue sofa and some cactus, but I know mine will never look as awesome as yours. I love all the great colors in this room which really brings out the color in your decor. You have some great pieces. Thanks Marlene – I had fun adding so much color! It looks amazing! I am in love with that blue couch! kelly, you always have the coolest interiors style. you’re the hip kid but in room form. love how your new living room turned out. Tell that part about me being hip to my kids! 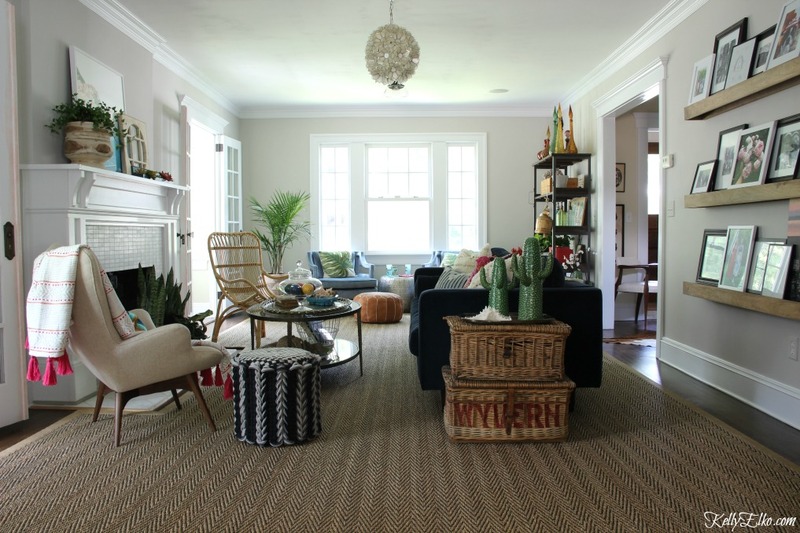 The grey color on the walls really brightens the room and the rug… LOVE! You are so good at mixing and matching. It all looks so good. I think my fave is the little details you have all around, like the squirrel matchstick holder. So cute!!! It’s wonderful!!!! Love this so much Kelly! Beautiful styling and love the colors. Thanks so much Stephanie – coming from someone with such amazing style, that means alot! 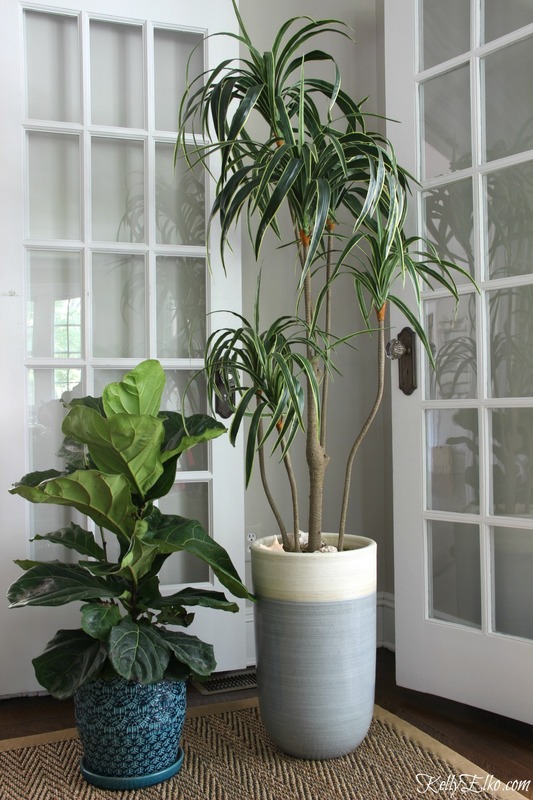 Thanks Pat – I’m loving all the plants in the room! Your room is full of cute surprises. 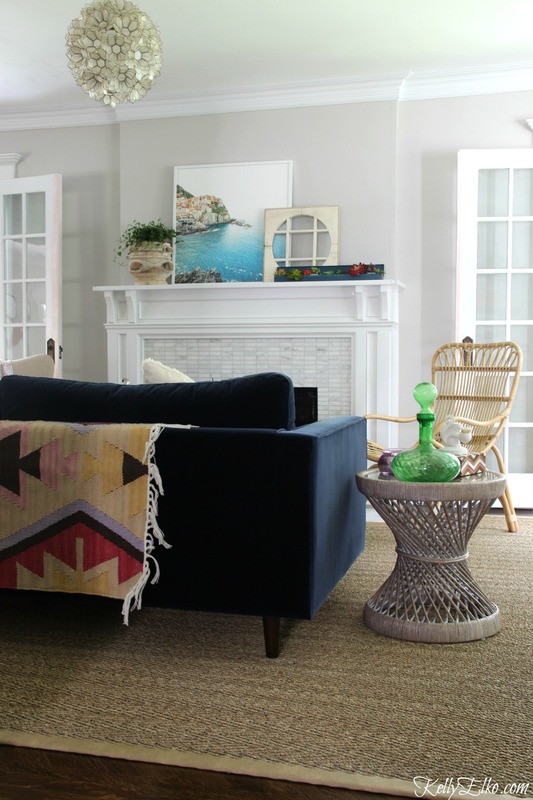 I love how you take what would appear to be a bunch of random pieces (before you style the room) and make it look like each piece was created to compliment the other pieces in the room. Love it! Thanks so much Karen! Your nod of approval means alot! I have always loved your sense of beautiful color Kelly!….This room is truly amazing and it truly says Kelly lives here! Gorgeous! You’re so sweet Shirley! Kelly (and Sushi) definitely live here! are amazing, and have me looking for some in those colors. Love the plants too. That sofa, though! Love. Coming from the queen of color, that’s an incredible compliment Anita! Kelly this space came out beautifully and I love the sofa!!! Such a cozy spot and I love all the accents you added. Thank again for inviting me to partner with you all 🙂 Have a wonderful week! Thanks Jessica – it was such a fun makeover! Kelly, I love your room. My current living room is shaped like yours and this has really inspired me to make some needed changes. I unashamedly plan to copy some of the color elements and layout you have here. My question for you is if you were to add window treatments, what would you do? I need them in MY lliving room for privacy and wonder if I should keep them neutral or something with color/pattern would be better. Hi Sheila – thanks so much and copy away! Are you thinking curtains or blinds? You can go either way with curtains – colorful or neutral. If going with blinds or shutters, I like the look of clean white. It all depends what else you have going on around the room. Pattern from curtains would be a fun backdrop to solid furniture. I like the softness of curtains, so probably will go with a curtain again. Window treatments are the hardest for me. My sofa is velvet in a solid aqua/blue similar to the color of your chairs and I am looking for a new chair in a neutral – much like your Teddy Bear chair. I, for sure, am ordering the ottoman as I really love that. Question, is it the cognac or the brown color? 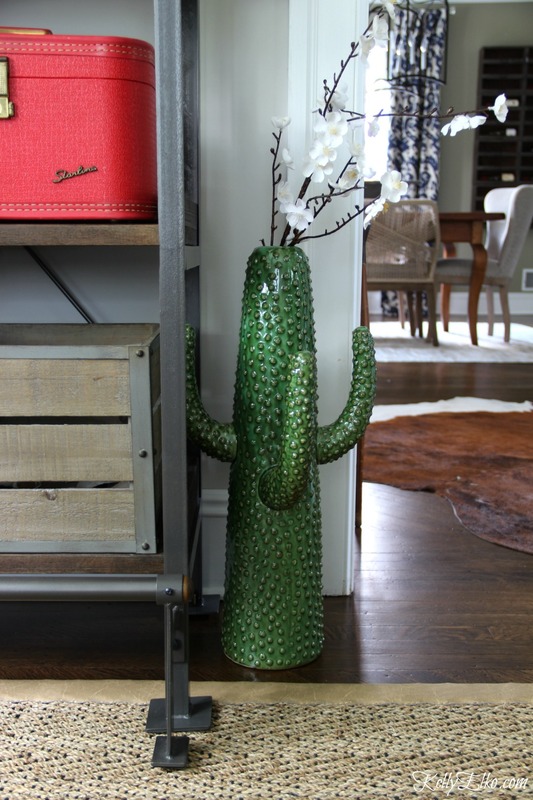 I very much love your little quirky elements like the cactus vases, and is it weird that I now want a vintage ash tray? Anyway, I am having so much fun having finally found a space that inspires me. Thanks! What paint colors are on the wall and trim? Abby – the wall color is Ben Moore Agreeable Gray and the trim is Ben Moore Decorator’s White. We all need some color in our lives! The all neutral tones just didn’t do anything for me. 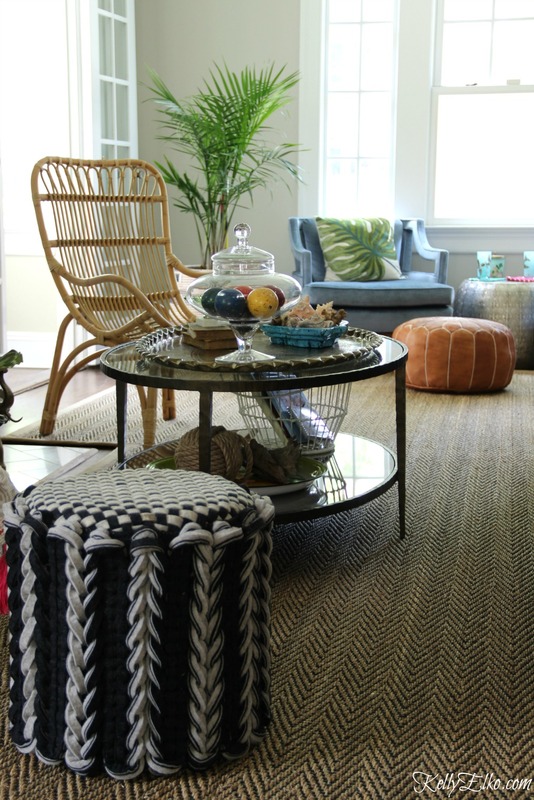 But I do love that rug! Can you tell me where I can get the floor rug. I love the weave pattern and that it is trimmed.